The holiday season is upon us! Here are 3 things you can be doing to engage customers now. 1) Encourage creating and sharing wishlists. Creating a wishlist is a great way for users to see all you have to offer, scouring all the different section of your website. So how can you encourage them to do so? Here are 2 retailers with different approaches. Land of Nod offers a chance to win a gift card to anyone that creates or adds an item to an existing wishlist. The design is short, simple and festive. The bold headline and minimal text makes it quick and easy to know what they’re offering. Subject Line:  WIN YOUR WISHLIST. American Eagle offers the chance to win your list (for up to $500). The subject line is straight-forward, complete with emoji to make it stand out when scanning your inbox. Their headline says it all, in big animated letters, above the fold. However, I feel the design is lacking a bit of festive flair or some type of product/graphic to make it more memorable. I might also suggest inverting the call-to-action to give it more pop. Both are great strategies. I might even take this a step further by offering extra entries for sharing your list. The pre-filled email or social media post could mention the sweepstakes (to gain new subscribers) along with a link to the list. Set yourself apart. Try something new and creative to make your brand/products stand out. Children’s Place is promoting their new unique online gift cards. You can choose from a pre-made animated eCard, a custom card where you can add your own video, or a digital photo-book gift card! Plus, they add in the bonus of a $10 coupon with any $40 eCard purchase. I haven’t seen anyone else offer a video or photo book gift card and love the idea! It’s a nice personalized touch that transforms “I ran out of time/ideas” into I made this just for you. Subject Line: NEW – Animated eGift Cards are here! The email is also well designed. They grab your attention right away with the animated card placed above the fold. The 3 card types are clearly defined with numbers and scannable headlines. It even has flow with staggered numbers and the addition of arrows. 3) Keep people coming back with daily prizes. 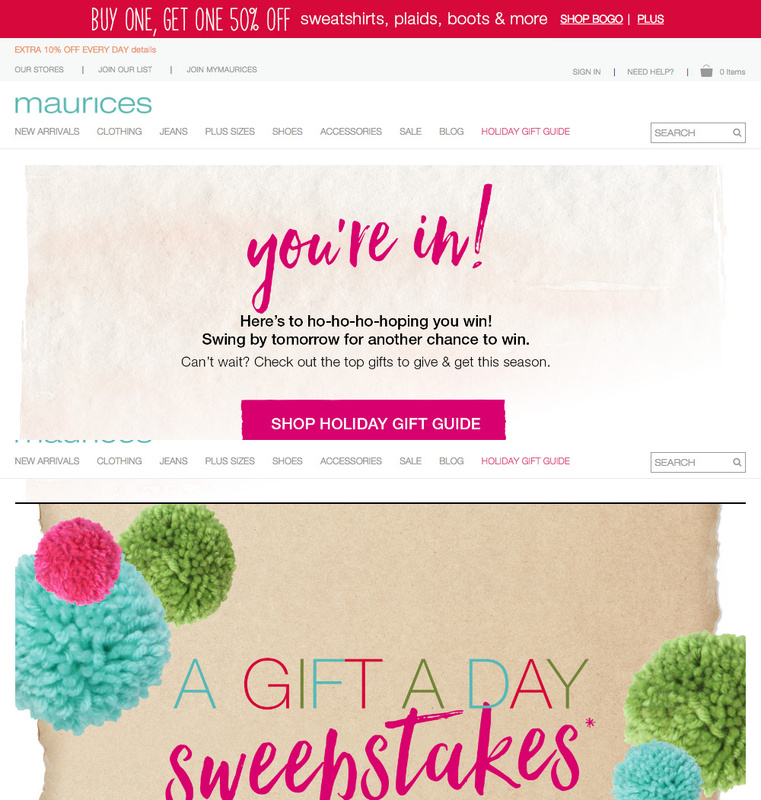 Maurices is offering a “Gift a Day Sweepstakes.” I’m a sucker for these emails. I will actually keep them in my inbox and click on them daily. This is a great way to engage your subscribers. However, I feel this campaign was lacking in a few areas. Subject Line: You could WIN a GIFT A DAY! The email states: 1 sweepstakes, 12 gifts, 60 winners, enter daily. It shows 12 numbered products. I was confused if you win certain products on certain days or if they were showing the 12 things you could win at any point during the sweepstakes. I also had to look at the fine print to find the cut-off date. So, a little more clear instruction would have been nice. One final thing, in an Ulta email that had a similar promotion, they told you after your daily click if you were a winner or not. With this campaign, they say “Here’s to ho-ho-ho-hoping you win! Swing by tomorrow for another chance to win.” I’d like to see a little more info about when and how the winners will be announced. In short, the learning points here are: be clear in your messaging, don’t forget the details, and remember opportunities for click-through. Subject Line: Fall finds & a FREE gift! TJ Maxx offers a private shopping event for card holders. What a fun way to retain customers (by showing appreciation), encourage new card subscribers, and get people shopping! Not only do you get to browse the new fall selection with a smaller crowd, but they throw in some extra perks — a free tote and breakfast! Ummmm, yes please! They sent a few emails, but this one caught my eye with the donuts, lol. I also like the animation that grabs your attention and staggered flow that keeps you scrolling. As an added bonus, it’s smart thinking that they allow you to download a digital version of your card in case you lost yours. After the event, they followed up with this email. The pictures make it look like a fun experience and I also see there were “exclusive” racks. It made me regret missing it and definitely enticed me to catch the next one. As if reading my mind, below the pictures are details for the next event! Bottom line– if you’re having trouble getting attendants at your in-store events take these notes: snacks, freebies and fun follow-up pictures!! No joke – this email is great. Mother’s Day is right around the corner. I love Loft’s approach to celebrating the holiday. They decided to do a mother-daughter photoshoot with the staff! The email introduces the staff member & their mom, has a personal quote about their relationship, and (the best part) includes a throwback photo of the two of them together. I like how personal this email is — you really feel like you’re getting to know the people “behind the curtain” at Loft. To top it off, all moms are dressed in Loft attire! It’s a great way of showing how versatile their clothing line is. Plus, it doesn’t take any stretch of the imagination to picture your own mom in the same wardrobe. They include calls-to-action that lead you to buy the clothing they’re wearing. Loft took two different approaches with this message. In this email they focus less on the individual staff members (removed the names, quotes and throwback photos) and made it more of a general message. They rely on you to click through to the landing page to learn more about the staff/moms. In this email it’s less obvious to me that the mothers are wearing Loft clothing (in the other email the copy points out that the moms are stepping in as models). Because of this, I find the main call-to-action (shop now) a little out of place. I would expect to see the “meet our moms” CTA first. Still, it’s very sweet and personal (because of the photos), but I favor the content in the other version more. 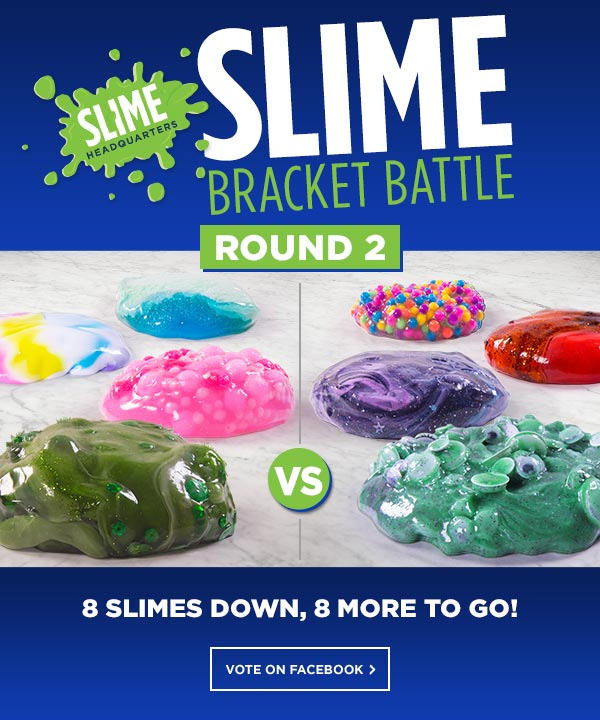 While sports fans are glued to their basketball brackets, Michaels has started a bracket of their own — for SLIME! If you’re a parent, you’re probably aware of the latest craze sweeping the kid nation: homemade slime. One of the key ingredients is Elmer’s glue and it has been flying off the shelves like hot cakes. 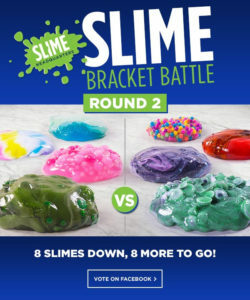 Michaels jumped at the opportunity to announce that their 1 Gallon bottle is back in stock and to call attention to their “slime bracket” where you can vote on your favorite DIY blobby creation! Are you more of a shimmery mermaid fan or a gooey zombie brain type? The email encourages you to hop over to Michaels’ Facebook page where you’ll find images of the different varieties teamed up against each other. Vote for your favorite and see if it makes it to the next round. What a great way to spark interest and get people involved with your social network! The email includes product images of the googly eyes, beads and pom-poms needed to create a few of the slimes from the bracket. All the gooey options are sure to inspire new ideas and encourage you to shop where you know ingredients will be available. Michaels did, however, miss an opportunity by not linking the products. I (along with other Facebook commenters) would have liked to see full ingredient lists for each creation along with measurements. Finally, I wish the email didn’t go on to cover Morph and Easter products; it felt like too much crammed into one email. If they were mentioned as a small sub-message it wouldn’t be so bad, but they took up half of the email. Overall, this strategy is a fun way to inspire people to shop while encouraging social engagement. This Easter: Hunt for Savings! Subject Line: New eggs have been hidden! Join the hunt for special treats! Mark & Graham came up with a clever way to get into the Easter spirit while encouraging people to browse their website. Here’s the deal: Any product with an Easter egg graphic by it is 20% off! The play on words are just too fun — like the holiday, you must go “hunting for eggs” and place them in your “basket” to claim your reward! Even businesses that don’t sell Easter products can use this concept to celebrate the season. Subject Line: Don’t miss out! Free Shipping on your first order! These emails by Rejuvenation are the new evolution of design. Two major staples of my methods include: 1) creating flow by staggering products and 2) not overwhelming layouts with too many products. These email do neither, so WHY would I find these emails so aesthetically pleasing? The answer is in the photo zooms! If you tried this layout with photos of a typical shooting distance, it would become overwhelmingly cluttered; your eye wouldn’t know where to look and your brain would have trouble processing every element before you got bored and moved on to the next email. The zooms, however, add a clear and beautiful level of detail that are simplistic and easy to digest. Each image leaves you wanting more. The angles that the photos were taken at are also important; if each photo was shot head-on, it would become stale and lack movement. However, Rejuvenation cropped each image to add balance and interest to a layout that would otherwise be devoid of flow. I also love how each design has its own color scheme; every image coordinates with the hero perfectly. A Very Merry [something] to You! We live in a politically correct world where people can be easily offended, so simply wishing subscribers a Happy Holiday can be a tricky thing. Because Christmas and Hanukkah are religious holidays, you don’t want to exclude anyone or step on any toes. Here are a few ways retailers messaged their subscribers this year, ranging from the daring to the all inclusive and a little vague. I was surprised to see a few retailers going with the Merry Christmas message this year. I personally only recommend going this route if your company is clearly marketed toward a specific religious group (ie: The Christian Book Store). I wouldn’t want to offend and potentially lose a customer. Subject Line: We Wish You a Merry Christmas! There’s no doubt which holiday Michaels was backing this year. Their headline spells out in all caps and dancing letters, “MERRY CHRISTMAS.” It is colorful, festive and attention grabbing. One nice thing about singling out a holiday is you don’t have to worry about choosing imagery that caters to everyone (for example snowflakes over Santa). They went a bit generic though with gold glitter stars throughout the email –glitter seems to be a common trend among holiday emails of all types this year. Subject Line: Wishing You A Merry Christmas From All Of Us! 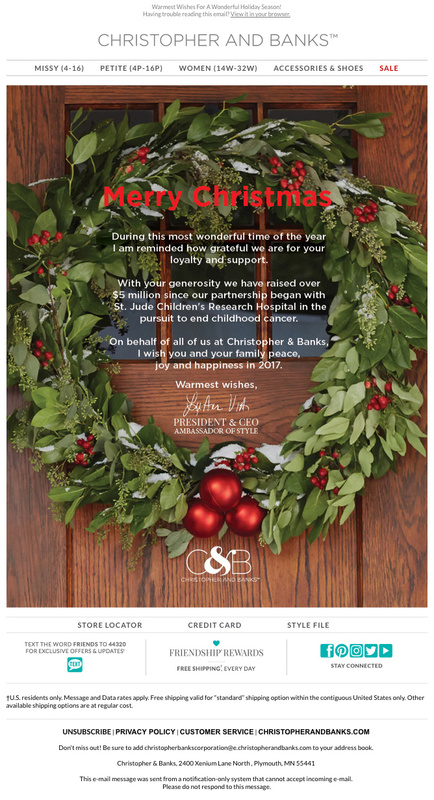 Christopher & Banks also wishes a Merry Christmas in both the subject line and headline. 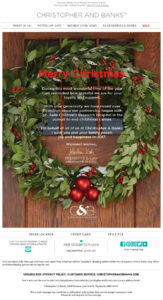 They chose a nice photograph of a wreath hanging on a front door to fill the design. The copy is heart-felt and personal, coming from the President & CEO. I always enjoy receiving these types of communications (personal letters). It’s a nice reminder that there are real people behind the company that appreciate my business. 2. Did We Cover Everyone? These emails did their best to incorporate multiple December religious holidays. This method can be fun and a little comical with original holiday phrases. It also shows your desire to bring everyone together. Cupcake Polish invented the word “Christmahanakwanzika” in their subject line. Their email went on to read: “Merry Christmas! Happy Hanukkah! Happy Kwanzaa! Happy New Year! We hope you are having a great day no matter what you celebrate!” I like how all encompasing it is with a bit of humor. The email design is a little lack-luster, but they did included a graphic “word cube” that includes all the holidays with some graphics. Madam Glam started with a similar approach, using the subject line and headline Merry Chrismukkah, but the copy leans a bit more Christmas (mentioning Santa). The graphic they chose could be viewed as generally winter themed — a tree made of glittery gold hearts, surrounded by falling snow. Overall, not a bad email, but make sure to stick with the plan from beginning to end. Gap started out with a vague subject line (May your day be merry and bright), but got more specific within the email. They laid it out plain and simple: Merry Christmas and Happy Hanukkah from our family to yours. The imagery is winter-clad models sporting cozy hats, coats and scarves. Glittery titles and background add to the generic but wintery design. And finally these retailers took the safe approach by sending well-wishes in a general way. It’s honestly the safest approach. It’s a way to say, hey, we care about you and want you to be happy, whatever you’re celebrating. There were plenty that used the well-known “Happy Holidays,” so here are a few that used an alternative method. Tiny prints decided to go with the headline “Merry Everything.” Since this choice of words doesn’t call out any holidays specifically, I’m going to place this under the slightly vague category. It is all encompassing, but a little noncommittal. It’s not a bad option, but I did find it a little funny to read, thinking, “Wow, they really weren’t sure what to say here.” It is, however, one of my favorite designs with texture, depth, color and even a subtle animation. Subject Line: Merry Christmas + a treat for you! Although the subject line is clearly Christmas, the email itself is more general holiday. The headline reads “May Your Day Be Merry & Bright!” The design, while colorful and creative, got the creepiest award in my book. The good: a model with a winter hat surrounded by doodles of snowflakes, doves and swirly patterns. I could even be okay with the strange choice to doodle a mustache on her, but … The creepy: they add an animation of her winking in a really weird and unnatural way. The right eye doesn’t squint as it should in a normal situation. It’s just a little unsettling. Subject Line: Brightest holiday wishes. Serena & Lily went with a broad headline, “Wishing you a bright holiday.” They created their own unique graphic of a snowflake containing drawings of home furnishings. They also animate a little sparkle. I have to say, it is quite unique, but the design lacks a bit of flow and color. As far as these day-of holiday emails go, I prefer it when the message is solely focused on well-wishes. It shouldn’t look like a last-minute inclusion tacked onto the top of a product/sale message. It makes the message a little less personal, not to mention that not many people will be shopping on the day of the holiday they’re celebrating. However, I don’t mind the addition of a link to send a virtual gift card. That’s an easy last-minute gift that doesn’t involve shipping or leaving the home. 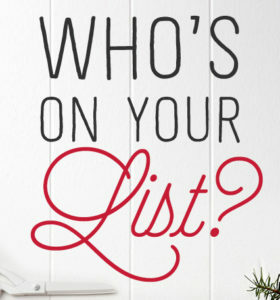 Maurices is running a promo that qualifies you to win your holiday wishlist. They call it the “Wish Pin Win Sweepstakes.” To enter, you fill out a small form, then pin any number of their products (to Pinterest) along with the required description line: On my wish list #wishpinwinsweepstakes #discovermaurices. I’m not quite sure how the user is linked to their Pinterest account, but I’ll leave that to the experts. The idea behind this promotion has many advantages. 1. Engagement. It encourages shoppers to browse through the website, in turn finding products they’re interested in. 2. Customer Acquisition. By entering the contest, Maurices can gain access to a potential new customer’s contact information and ask if they’d like to receive future emails. 3. Future Targeting. By creating a wishlist, Maurices can better target each subscriber based on products they’re interested in. In this case, it can be obtained through their browsing history (since the wishlist is created in Pinterest rather than through Maurice’s website). 4. Even More Customer Acquisition. By posting products on Pinterest, word will spread about the best items you have to offer. Not to mention, products look so much better when suggested by a friend. 5. Conversion. By encouraging people to pin these items, the tedious work of browsing and compiling is now done — it’s easy for them to share it with friends and family. BAM, holiday wishlist complete. 6. Customer Retention. Offering contests keeps customers happy and waiting for the next opportunity to win. Overall, this is a great way to market yourself using social media. 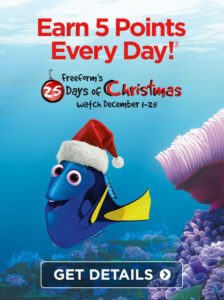 For the month of December, Disney Movie Rewards is giving free reward points for clicks! On December 1st they sent an email announcing the promotion: “Earn 5 Points Every Day!” I clicked the CTA in the email, logged in, and earned my free points. BOOM. Done. Easy. The second day, I went to get my points but saw new instructions. To receive points I must now visit their Facebook, Twitter OR Pinterest page. There, I would find a link to a magic code. I can then use that code on the Disney Movie Reward’s website to redeem my points. 2. Encourages them to “like” the page so they’ll be reminded to redeem points (therefore opting in to future posts). 3. Also, by liking the page, and/or posts, their friends will become aware of the promotion as well. There are a few things I might change about their strategy, however. 1. For the kick-off email, I would make it clear how the process works (that social media will be involved). Rather than linking to the Disney Movie Rewards website, I would provide call-to-actions to their social media pages. 2. It seems like a lot of steps to earn your reward. Rather than listing a link within the social media post, I would like to see the code displayed there instead. I can only think of one reason why you might want to use a link: to direct them to a page with more opportunities for click through / conversion. In this case, the landing page only has the magic code. Overall, still a creative way to incorporate social media. Kudos to Maurices and Disney on finding unique ways to grow your customer base and engage existing customers through social media. Looking for a way to spruce up your holiday emails? Here are a few tips, sure to catch the eye! 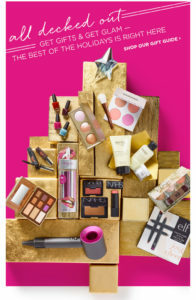 These emails cluster products together to form holiday shapes. You can go many directions with this idea — snowflakes, stockings, presents, etc. The sky is the limit! Subject Line: Wrap up all the GIFTS on your list today! Charming Charlie took the extra effort to add twinkling lights on their “tree.” I also like that they chose products with coordinating colors. Ulta created a tree out of gold gift boxes and stacked the products on top. In a brilliant move they list each product individually below with a CTA. The products are also staggered and tilted for great flow. Awesome job. Even the smallest change, like a font, can make a big statement. Subject Line: 40-50% Off & FREE All End Tonight. For Real. 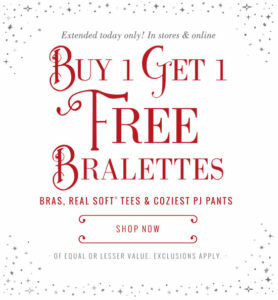 Aerie introduced a new font for the holiday season. The capital letters now give the feel of a magical winter wonderland. Starbucks is using a new cursive font, minimally, in the key words of their headlines. It’s a sure way to make certain words POP and set a tone for the email. I like Gymboree’s creative way of displaying their sale promotions. Each deal is listed as if it’s a road sign at the North Pole. The little characters at the base of the sign are a nice touch too. Very cutesy and on-target for a kids’ clothing store. Sur La Table’s red ribbons not only add a festive feel but also dimension and flow to the design. They’re precisely placed to accent each image and point to the next section. The staggered and tilted images also help to add to the flow. The white negative space really helps to keep all the images from feeling overwhelming. Love. There’s a lot going on in this email (it’s overly long with a mix of styles), but I do like how Michaels lists their categories on gift tags in this section. 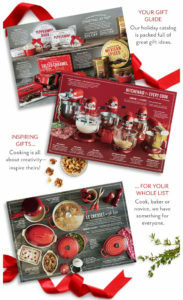 They are a great way to add a holiday feel while giving a pop of color, and making your call-to-actions stand out. Subject Line: It’s spiced. It’s iced. 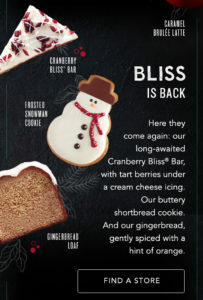 I love the chalk-drawn spruce & leaves surrounding the products in this Starbucks email. They are a nice wintery touch with sophistication. The monotone color doesn’t distract from the products, but works as a nice accent. They also create great flow between products. Subject Line: Just hours left for free ship + extra 30% OFF sale! Anthropologie’s stacked, wobbling packages create a fun holiday feel. I love the hand-crafted look as if it’s cut and pasted watercolor gifts, complete with drop shadow. It’s a very stylized and unique look, sure to catch the eye. Subject Line: You have a gift for giving. HomeGoods included this fantastic stop-motion animation of products being placed into a box and wrapped up. It’s so much fun to watch. It’s a nice way to show a variety of products available for gifting. I would love to see each product called out by name with CTAs below. is 80 stars toward a free drink reward. Half off any frappuccino size or flavor. Creative and fun to read. What better way to make your email memorable than to plant an “ear worm” in someone’s head? Song lyrics for headlines or subject lines do just the trick. 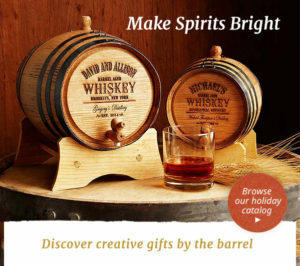 Uncommon Goods uses, “Make Spirits Bright” as a title to their message about a custom whiskey barrel. I can’t help but sing it while I’m scrolling. I especially love that they took care to picture the correct amount of products. The design has nice flow with staggered products that overlap into the next section. These are just a few ideas to inspire you. Don’t forget to have fun and be memorable. Happy holidays and to all a good night!